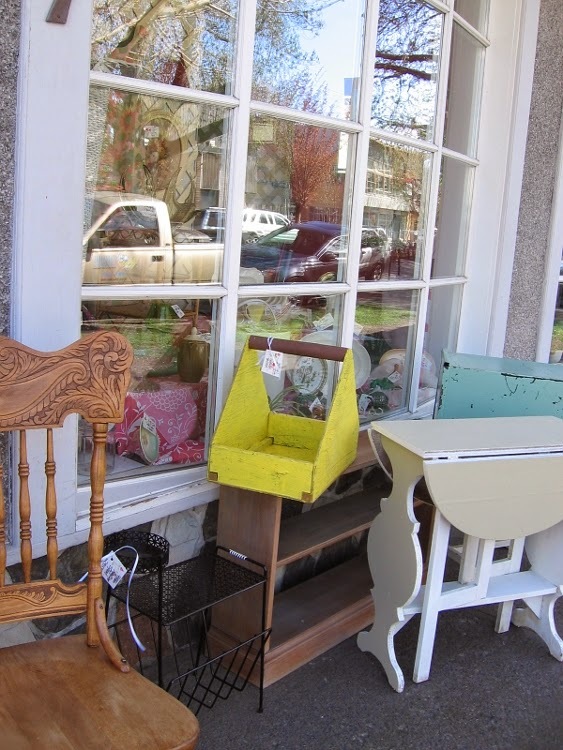 I enjoy window shopping, I suppose that has a lot to do with my display background, it is interesting to see what the the current trends are. 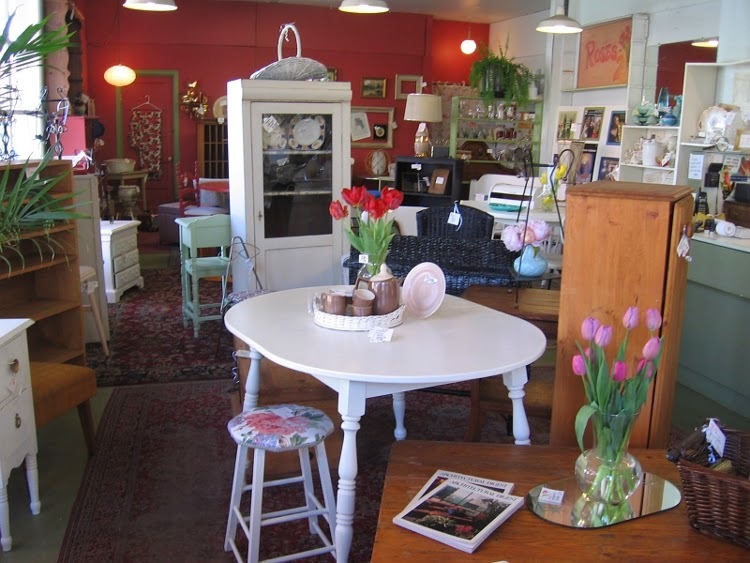 I also love browsing and shopping at thrift stores, second hand shops, and flea markets, they are my source for textiles and accessories for the ornaments and sculptures that I design and make. This last week I have been downsizing the items that have been accumulating in my studio and garage. That doesn't mean that I haven't found some great items to incorporate into future sculptures, I am just being more selective. 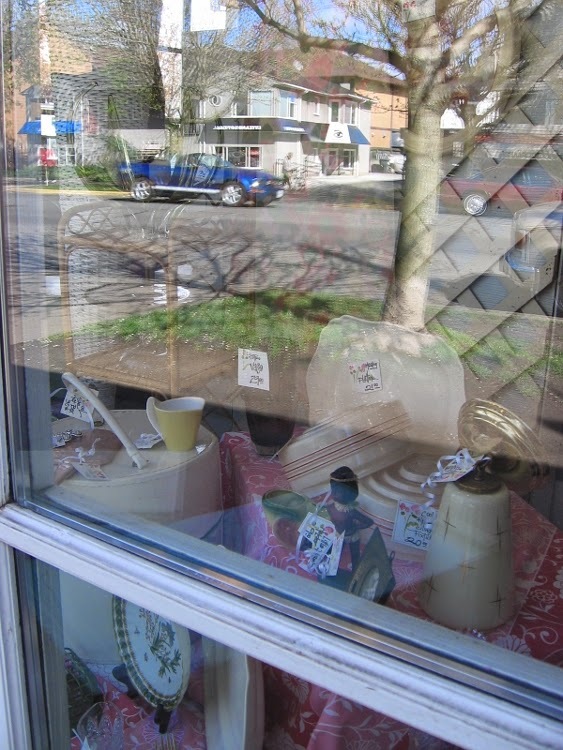 "Kay's Corner" at the corner of Cook St. and McKenzie St. in the Cook Street Village in Victoria always has an interesting selection of vintage items on the sidewalk in front of the store. Each time I visit the shop there is always something in the window display that catches my eye. 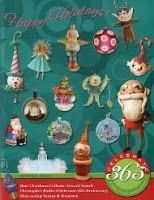 The prices are very reasonable and the owner is very friendly, I always enjoy browsing around there. I like browsing the thrift shops this is where the ideas originate. Sometimes I see an item and the piece has given me a finished design, while at other times there is something about the shape and colour that says it will work in a sculpture. 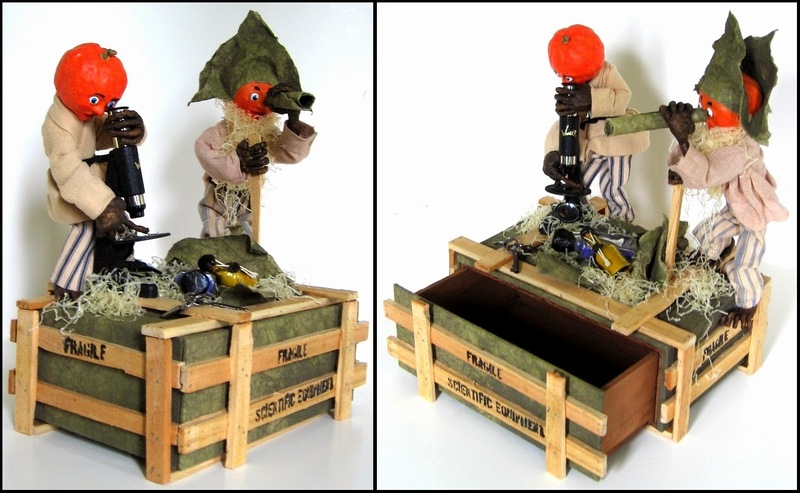 The wooden drawer front chocolate box that is used in "Vegetables Gone Bad - Jake and Dewey Sneak Into the Professor's Laboratory"
was originally going to be a package that was getting ripped open by veggie guys, but a parcel was not that interesting so it became a shipping crate. The 1950's Wonderscope pulled it all together. Everything that I look for was used for something else. 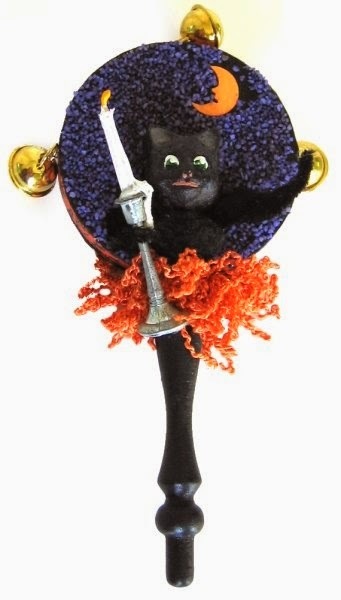 The candlestick that Black Cat is holding in this "Portrait Rattle - Black Cat's Midnight Stroll" is a game piece from an old Clue game, the fringe at the base of the rattle came from a vintage cushion, and the bells although new came from chocolate figures. The candlestick was the inspiration for this rattle. I am always on the look out for millinery flowers. I have a lot of the larger flowers that were used on the 1950's and 60's women's hats but the smaller flowers are the ones that I am trying to find more of. 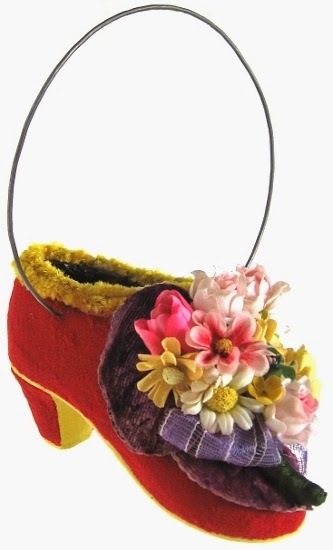 This shoe candy container ornament, "Red and Yellow Victoria Shoe", makes use of some of the small flowers to create a bouquet with the stems wrapped in vintage rayon ribbon. There is a small tulip in the mix of flowers. I would love to get more of those miniature tulips, it is made of celluloid. That was the only tulip that I have ever come across. I must get back to work. I am in the process of making a large supply of blanks, creating new graphics for the shop keepers that will be making an appearance on the sales blog, and tidying up! Oh the tidying up!